Home Culture Romeo Finds His Juliet In A Remote Bolivia Cloud Forest! Romeo Finds His Juliet In A Remote Bolivia Cloud Forest! The world’s loneliest frog finally finds his mate! If you thought world’s perfect love story doesn’t exist, then you are wrong. What is more adorable than grandma and grandpa growing old together? It is a frog who finally meets the love of his life after having waited for ten lonely years. You thought only you could get right swiped? Wait till you hear Romeo’s heart touching story, which is better than Romeo and Juliet because unlike them, the frog’s prosperous love affair is real and ends on a happy note. Romeo had spent a long time alone and in isolation. He had given up all hope for love being the last surviving Sehuencas and the last of its kind. Like the princess who kissed a frog to turn him into a prince, Romeo has found Juliet who would nurture him back to life and give him a meaning to live, not merely exist. Romeo was discovered in Bolivia ten years back. The sehuencas class of water frogs is almost extinct making Romeo one of its kinds. 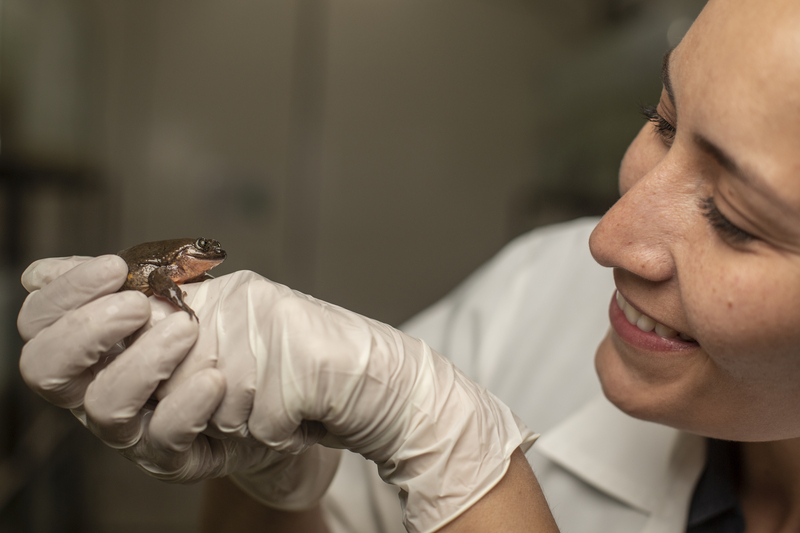 Romeo was staying in an aquarium in Bolivia until a Teresa Camacho Badani (chief of herpetology at the museo de historia natural Alcide d’Orbigny) headed expedition team found the love of his life, his Juliet! Romeo was probably the most desirable bachelor of his times. It is surprising he didn’t find anyone sooner. His dating profile has a more interesting bio than most of you. It says, “not to start off heavy or something but I am literally the last of my species”. From being the world’s loneliest frog, he now has taken a lover and we hope they live happily ever after. Badani and team after a lot of rummaging found five Sehuencas in a Bolivia cloud forest. The main idea behind the expedition was to breed and hence prevent complete extinction of the species. They rescued two females and three males. Well, Romeo found love in a Bolivia forest, what about you? Romeo and Juliet are apparently meant for each other, they are a bit different from each other but you know what they say, opposites attract after all. But the story, besides their amazing chemistry draws attention to the need of the hour which is to preserve our endangered species. Wildlife and natural resources are in danger and soon there will be no more Juliets for all the lonely Romeos out there. But we are happy for Romeo and Juliet, who found each other in the midst of climate and habitat change and the threat of extinction. Still a better love story than Twilight. Isn’t it?